Somewhere in Holland, a dike holding back a slew of new Uncharted 2: Among Thieves screenshots and concept art just broke wide open. Full-resolution screens from an area in the game not seen in either of the two videos released thus far have appeared on Dutch gaming site XGN, and are quickly saturating the rest of the 'net. Naughty Dog has confirmed via the NeoGAF forums that these are, in fact, in-game shots. They show protagonist Nathan Drake shooting, sneaking up on, and grabbing a riot shield from new, decidely non-piratey enemies. There's also been a breach of a reservoir carrying concept and character art, one piece in particular showing Drake's new sidekick, Chloe. All told: head explode? 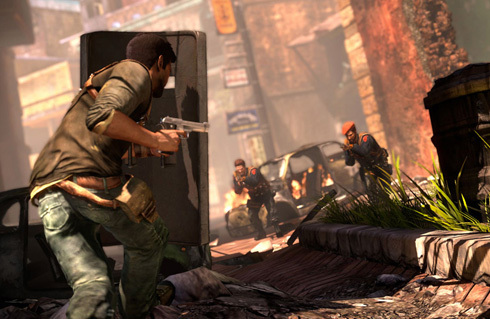 New Uncharted 2 screens, concept art leaked originally appeared on Joystiq on Mon, 15 Dec 2008 17:00:00 EST. Please see our terms for use of feeds.